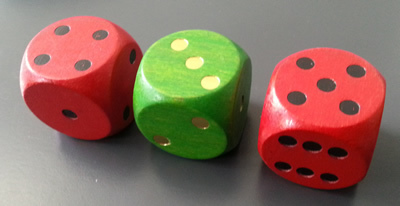 Two dice are RED and one is GREEN. Roll the dice and add up the numbers on the two RED dice and then subtract the number on the GREEN. So if one RED is $4$ and the other RED is $5$ and the GREEN is $3$ we should add together $4$ and $5$ to make $9$ and then subtract the $3$ so that gives us a final answer of $6$. You'll need to roll these dice many times and see what numbers you make each time by doing the addition and subtraction. what are the final answers by doing the addition and subtraction each time? what are all the different possible numbers? is there a good way of making sure you find them all? how will you record what you've found out? Look at your results and write down some questions that you could ask about them. For example, do any of them have the same answers? If so, why? Interactivities. Addition & subtraction. Combinations. Theoretical probability. Multiplication & division. Dice. Experimental probability. Investigations. Visualising. Working systematically.